Think Humanities, Episode #18, "Kentucky Reads" from Michael Breeding MEDIA on Vimeo. LEXINGTON, Ky. (July 12, 2018) — Robert Penn Warren’s groundbreaking novel of politics, power and corruption, "All the King’s Men," was published over 70 years ago to wide acclaim. It was a bestseller and won the Pulitzer Prize for Fiction in 1947. The book remains just as challenging and relevant as it was when it was first written. This cautionary tale of politics continues to provide insights into the machinations and motivations that drive the American political system to this day. In celebration of this classic novel, the University Press of Kentucky has partnered with Kentucky Humanities on its new statewide literacy project, Kentucky Reads: “All the King’s Men.” The program will use Warren’s Pulitzer Prize–winning novel to guide a statewide conversation on contemporary populism and political discourse and their relationship to journalism. 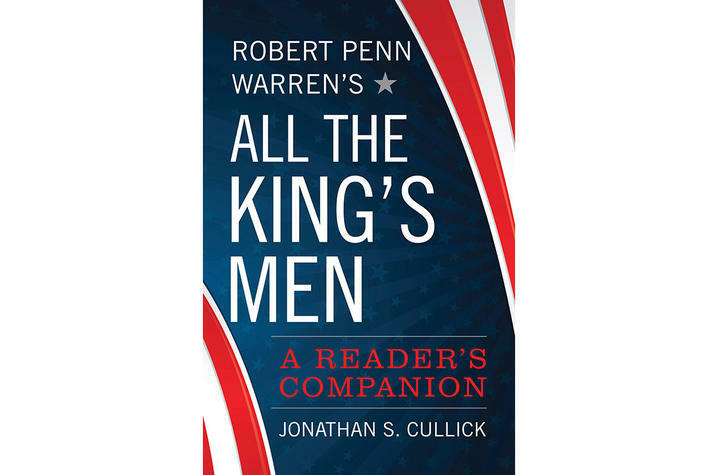 As part of Kentucky Reads: “All the King’s Men,” University Press of Kentucky has released "Robert Penn Warren’s ‘All the King’s Men’: A Reader’s Companion" by Warren scholar and Northern Kentucky University (NKU) professor Jonathan S. Cullick. Writing to be broadly accessible, Cullick provides the background, context and analysis needed to create a framework for readers to think about this complex narrative and its current political implications. "All the King’s Men" is as timely today as it was when Warren originally wrote it. Willie Stark was based on real-life politician Huey Long, but he is not merely Huey Long. He is any political player who compromises means and ends. He is every demagogue who manipulates language and manufactures an image of himself to seduce supporters. Though Long has been dead since 1935, his political tactics as embodied by Stark are still with us, and Warren’s “All the King’s Men” provides the tools for engaged citizens to hold not only their leaders accountable for their actions, but also themselves. Beginning with an overview the life of Warren, a native Kentuckian and the only writer to have won three Pulitzer Prizes in two different genres, Cullick provides a thorough summary of the novel and traces its impact on American political and popular culture. He charts the reaction to the book in the initial wake of its publication as well as how that appreciation grew with time. In addition to setting Warren’s novel in context, Cullick examines the themes that run through the work. He looks into the role of the reader as well as that of Stark’s followers, including the narrator Jack Burden. He also explores Stark’s use of rhetoric and his shift from appealing to his voters’ intellect to appealing to their emotions. Kentucky Humanities, with funding from the Andrew W. Mellon Foundation and the National Endowment for the Humanities, will host a series of community discussions and events centered on Warren’s celebrated work and what it can teach us today. Other partners for the literacy project include KET (Kentucky Educational Television), which will air the documentary "Robert Penn Warren: A Vision" this fall produced by filmmaker Tom Thurman, and the Gaines Center for the Humanities at the University of Kentucky, which will host bestselling author Jon Meacham at the Bale Boone Symposium. Meacham will talk about Warren’s impact on American literature and culture. 7 p.m. Tuesday, July 17, Kentucky Reads Online Book Club Bill Goodman and NKU creative writing professor Jessica Hindman will participate in a Facebook Live discussion of "All the King’s Men." 7 p.m. Tuesday, Aug. 14, Kentucky Reads Online Book Club Bill Goodman and Cullick, author of "Robert Penn Warren's 'All the King's Men': A Reader's Companion," will participate in a Facebook Live discussion of "All the King’s Men." 7:15 p.m. Wednesday, Sept. 5, Kentucky Theater Summer Classics presents "All the King’s Men" Kentucky Theater, 214 E. Main St., Lexington A screening of "All the King’s Men" (1949), Academy Award-winner for Best Picture, Best Actor (Broderick Crawford) and Best Supporting Actress (Mercedes McCambridge). 2 p.m. Sunday, Sept. 9, "Robert Penn Warren: A Vision" Sneak Preview Farish Theater, Lexington Public Library, 140 E. Main St., Lexington A preview of excerpt from the documentary "Robert Penn Warren: A Vision" and discussion with award-winning filmmaker Tom Thurman. 6:30 p.m. Thursday, Sept. 13, Community Forum Otto M. Budig Theater, 1195 Elm St. Cincinnati, Ohio The Scripps Howard Center at NKU hosts a keynote address from Cullick, author of "Rober Penn Warren's 'All the King's Men': A Reader's Companion," and a community forum on journalism and politics. 7 p.m. Monday, Sept. 17, Bale Boone Symposium UK Worsham Cinema, Gatton Student Center, Lexington The Gaines Center for the Humanities at UK presents the Bale Boone Symposium, featuring The New York Times bestselling author and historian Jon Meacham, speaking on the relevance of Warren’s work, from politics to race to regional culture. 6:30 p.m. CST Tuesday, Sept. 18, Community Forum Market House Theatre, 132 Market House Square, Paducah A live reading of scenes from the stage adaptation of "All the King’s Men" and a community forum on journalism and politics. 6:30 p.m. Monday, Oct. 15, Community Forum Actors Theatre of Louisville, 316 W. Main St., Louisville A live reading of scenes from the stage adaptation of "All the King’s Men" and a community forum on journalism and politics. TBD Monday, Oct. 22, Premiere of "Robert Penn Warren: A Vision" Van Meter Auditorium, Western Kentucky University, Hilltop Drive, Bowling Green The official KET premiere of "Robert Penn Warren: A Vision" followed by a Q&A session with Rosanna Warren, poet and daughter of Robert Penn Warren, and filmmaker Tom Thurman. TBD Friday and Saturday, Nov. 16 and 17, Jonathan Cullick at the Kentucky Book Festival Alltech Arena, Kentucky Horse Park, 4089 Iron Works Parkway, Lexington Cullick teaches the KBF Master Class for high school students on Nov. 16 and gives a main stage presentation at the Kentucky Book Fair on Nov. 17. For a full list of events visit https://www.kyhumanities.org/kentuckyreads.html. Kentucky Reads: “All the King’s Men” is part of the “Democracy and the Informed Citizen” Initiative, administered by the Federation of State Humanities Councils. The initiative seeks to deepen the public’s knowledge and appreciation of the vital connections between democracy, the humanities, journalism and an informed citizenry. Events will encourage more readers to engage with "All the King’s Men" and provide an environment for open and respectful discussion of the complicated but important political issues raised in the novel that could help foster understanding in today’s divisive political climate. Cullick is a professor of English and former chair of the department at NKU. He is the author of several books including “Religion in the Twenty-First Century: A Longman Topics Reader” and “Making History: The Biographical Narratives of Robert Penn Warren” and many articles on William Faulkner, Walker Percy, Warren, and other Southern and American writers and topics. University Press of Kentucky, currently celebrating its 75th anniversary, is the scholarly publisher for the Commonwealth of Kentucky, representing a consortium that includes all of the state universities, five private colleges and two historical societies. The press’ editorial program focuses on the humanities and the social sciences. Offices for the administrative, editorial, production and marketing departments of the press are found at UK, which provides financial support toward the operating expenses of the publishing operation through the UK Libraries.